« Highway 26 Widening Postscript… and Requiem? In 1913, the young cities of Oregon City and West Linn suffered a serious outbreak of typhoid from an increasingly polluted Willamette River, their sole source of water at the time. The incident spurred Oregon City’s leaders to appoint a “Pure Mountain Water League” and directed it to locate a safer source of drinking water. The League settled on the pristine South Fork of the Clackamas River in the Cascade foothills. The City of West Linn signed on with Oregon City, offering to pay for one third of the cost of a new pipeline to bring the South Fork water to the two cities. A South Fork Water Board was created to carry out this ambitious project. 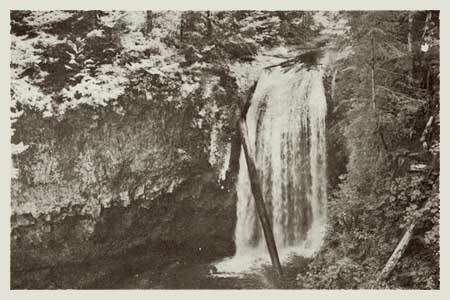 By the fall of 1915, the new water district had managed to lay twenty-six miles of 18” pipe from a site at the confluence of Memaloose Creek and the South Fork Clackamas all the way to Oregon City and West Linn. The new pipeline began to carry municipal water on October 7, 1915. In 1939 the South Fork Water Board expanded the system with the help of one of Franklin Roosevelt’s New Deal recovery programs, the Works Project Administration. This project extended a 24” pipeline upstream from the Memaloose Creek intake to a point upstream, above the 120-foot main falls on the South Fork. This project involved carving a series of three dramatic tunnels and a cantilevered pipeline through solid basalt cliffs. The new intake improved water pressure downstream, and this system continued to serve as the water supply for the two cities until a new filtration plant was constructed on the lower Clackamas River, in 1958. Both systems were used until 1985, when the South Fork pipeline was decommissioned. Since then, the network of roads, tunnels, plank walkways, log bridges and old pipeline has slowly been fading into the green rainforest of the South Fork canyon. 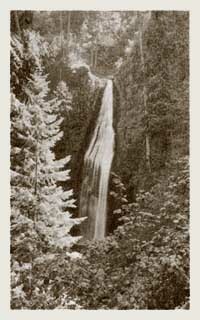 The story might have ended there, except for the series of spectacular series of waterfalls along the South Fork and Memaloose Creek. By the late 1990s, some of the region’s more adventurous kayakers had scouted both streams, and in the early 2000s, had documented the first known descent of the South Fork by kayak. These intrepid kayakers portaged the big waterfalls on the South Fork by following the abandoned tunnels and log bridges left behind by the South Fork Water Board. In doing so, they brought renewed interest to the area, as word of a high concentration of waterfalls spread to other adventurers. In total, there are five major waterfalls along the final two miles of the South Fork, and two along the last mile of Memaloose Creek, where it flows into the South Fork. 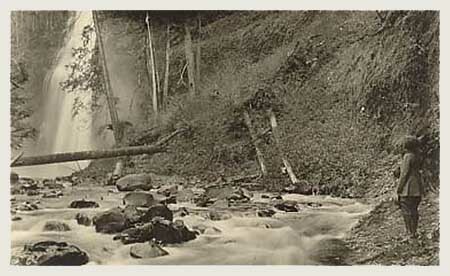 The old water works roads and tunnels reach two of the South Fork waterfalls, including the main 120-foot falls, as well as the main falls on Memaloose Creek. The remaining waterfalls are remote, and not reached by the water works roads. The tunnels and roads along this system are entirely intact and walkable – as several explorers have now documented. A timber bridge over the South Fork at Memaloose Creek is also intact, and is now used by waterfall explorers to cross the stream. These old roads and tunnels offer a unique opportunity for a new trail system that could build on the existing network, and offer an unparalleled blend of natural spectacle, historical artifacts and lots of insight into the history of the South Fork water works project, itself. What would this trail look like? The accompanying maps (above and below) show the sections that would follow old water works grades in yellow. All of these roads have been recently scouted, and are in good shape, and thus easily converted to trails. The six tunnels along the way (one along Memaloose Creek and five along the South Fork) are also in good shape, and easily walked, although at two are long enough that a headlamp is required. New trails would also be needed to complete the system, and are shown in red on the accompanying maps. A new trailhead and access trail would located on the east side of the Memaloose Bridge, following the Clackamas River downstream, then turning up the South Fork canyon and joining the converted water works grade at the lower South Fork falls (this section along the Clackamas would also serve as an extension of the Clackamas River Trail, extending east to Fish Creek, and the current trail terminus). 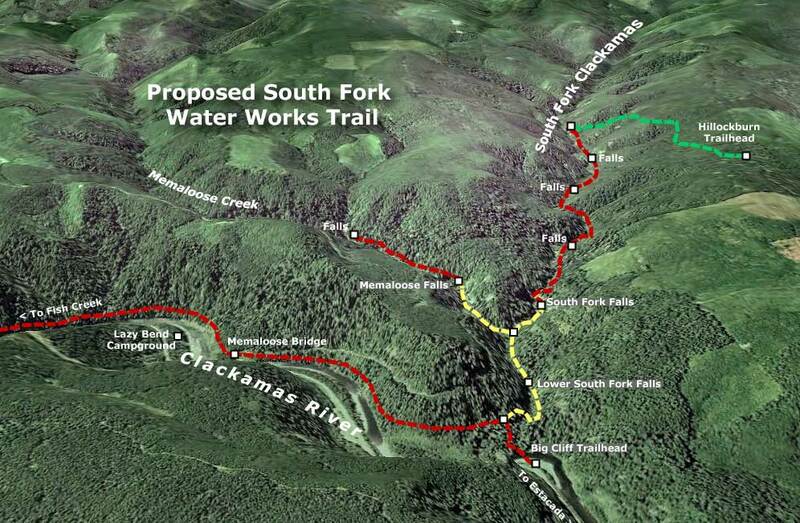 Two trail extensions would carry hikers deeper into the canyons of the South Fork Clackamas and Memaloose Creek, beyond the water works roads. A new Memaloose trail would climb a half-mile to a second falls, upstream from the main Memaloose falls. 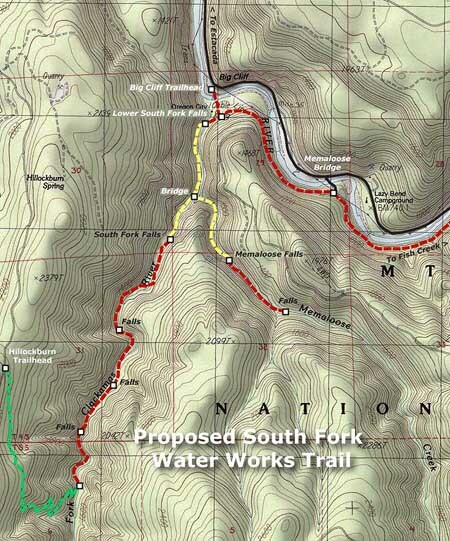 An extended South Fork trail would continue from the final waterworks tunnel, and travel 1.5 miles upstream along the west bank of the river, passing three remote waterfalls before ending at the existing Hillockburn Trail (shown in green on the maps). Look closely at the maps, and you will also see a proposal to add a trailhead at Big Cliff, along the Clackamas Highway, with a footbridge connecting across the Clackamas River to the new South Fork trail network. The concept here is to provide a family-oriented day-use area on this scenic bend in the river that serves as the long-term gateway to the South Fork canyon. Today, this spot is an eyesore – a huge dirt and gravel expanse that suffers from dumping, shooting and other unlawful behavior. The trailhead and day-use concept would turn this blank expanse into a place for families to explore the river and nearby trails, less than an hour Portland. Future trailhead and day-use area at Big Cliff? In deep, rocky canyons like the lower South Fork, building new trails is complex, costly and at odds with modern conservation ethics, where blasting a trail through cliffs is no longer an accepted practice. Thus, the ability to convert the water works roads would bring hikers into a landscape that probably would never be reached with modern trails. In many ways, the canyon is an accidental version of the venerable Eagle Creek Trail, in the Columbia Gorge, where the route is famously carved into the cliffs. The logistics for this proposal are also fortuitous. The water works area of the lower South Fork canyon was specifically excluded from the 2009 Lewis & Clark wilderness act that set aside the upstream portions of the South Fork canyon as new wilderness. This means that while the upper canyon trail must be built with wilderness restrictions in mind, converting the roads, repairing bridges and preserving the historical artifacts in the lower canyon won’t be encumbered by wilderness restrictions. This is a project whose time has come – in part, because the word is out about the scenic wonders of this beautiful canyon, but also because the historic features ought to be preserved before they are lost to time and the elements. This entry was posted on February 13, 2010 at 10:11 am and is filed under Cultural History, Natural History, Proposals. You can subscribe via RSS 2.0 feed to this post's comments. I have some ideas and a long history with this area. Contact me if interested.